BIO CHAIN CLEANER is a liquid grease cleaner obtained from natural extracts, over 95% biodegradable, ideal for bike chains and oil or grease lubricated parts. • Clean bike chains using brush or by adding required quantity to special CLEAN MACHINE. • This product, when conserved correctly in original bottle, maintains degreasing characteristics for two years. cod. 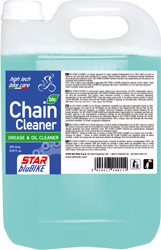 20011 BIO CHAIN CLEANER 250 ml. cod. 20028 BIO CHAIN CLEANER 5000 ml.